A down on his luck shock jock is working the mic at a small radio station when a zombie outbreak occurs. The reports come in via calls and he broadcasts the news to the wider area, struggling to make sense of the bizarre events. 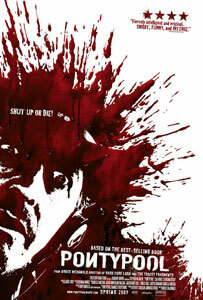 Pontypool is a real departure for the zombie genre. It throws out the normal rules in favour of a new idea and a style of execution which makes the most of a small budget. Fans of classic zombie flicks full of action and gore might find this too slow and more than a little muddled. The film relies heavily on the talents of Stephen McHattie as DJ Grant Mazzy and luckily he's up the task. This is tense and gripping stuff and it plays very cleverly with the radio format (it could work as a radio show). The revelation was a disappointment for me and things get decidedly awkward as the film runs out of steam but kudos for re-imagining the zombie genre.